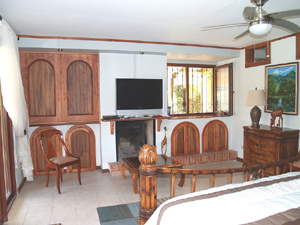 This unique custom home is located in the lovely village of Tronadora in a very quiet neighborhood near many part-time international residents in the nice local community. 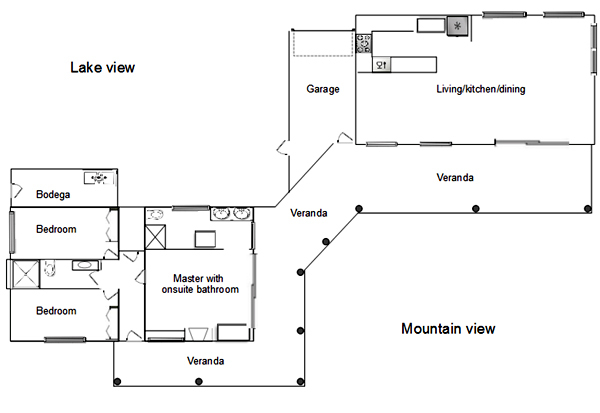 The large house has 3 bedrooms, 2 full bathrooms, open concept kitchen-dining-living room, and laundry room/bodega. 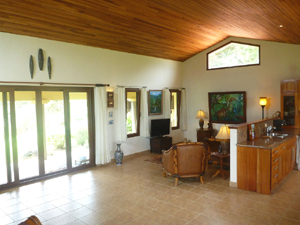 French doors in both living room and master bedroom create an indoor/outdoor living space, including a swimming pool with large deck that as a 180° view of Lake Arenal. A one-car garage with automatic door was recently added to the property.The grounds are well maintained and many fruit trees and exotic plants are planted throughout. The house was designed to minimize the view of neighbors and maximize privacy. Costa Rica's nicest town, Tilaran, with supermarkets, banks, pharmacies, doctors, restaurants, and many other stores is just 15 minutes away. The international airport at Liberia is only about an hour distant. In front of the home, a pasture descends steeply to a cove formed by one of Tronadora's two farming peninsulas beyond which lies a 180-degree view of the 20-mile long lake. Across the lake can be seen the village of Aguacate and the town of Nuevo Arenal. A wall of glass panels protects the pool and large patio on breezy days. 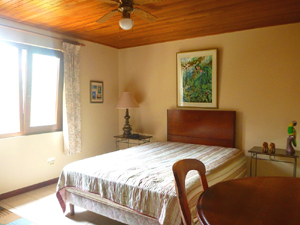 Lake Arenal has a lovely springlike climate year round and homes need neither air conditioning nor heating. The house of 2863 square feet is on a lot of .55 acre. In this Google Earth image, a yellow pin in the center labeled H216 marks the house. To the left is the village of Tronadora with stores, church, bus stop and homes laid out around a huge soccer field/park. 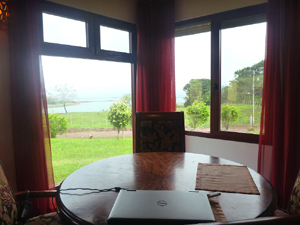 To the right of the house, pastures descend steeply to the warm waters of Lake Arenal. Passing in front of the home is a narrow road leading to the end of one of Tronadora's two restricted farming peninsulas, providing a scenic hike enlivened by possible sightings of howler monkeys and birds such as toucans, oropendolas, parrots, and many colorful smaller birds. 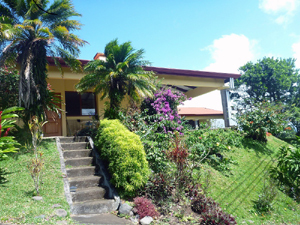 Next to this captivating home, the owners are offering a slightly smaller lot (1817 square meters) with equally stunning views for $55,000. It is very nicely landscaped and includes fruit trees. Click here for photos of this lot, L118. The unique home is composed of two buildings joined by the wide covered veranda. 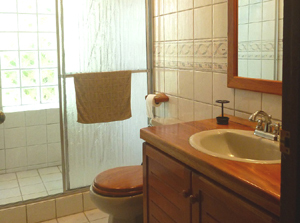 There are three on-demand water heaters and power flush toilets. The home has European style windows and french doors (tilt-turn system, all with built-in insect screens) throughout as well as ceramic tiles throughout the house. 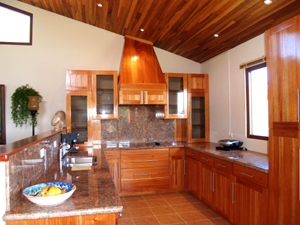 The kitchen, with fine custom hardwood cabinetry and modern appliances, is part of an open plan with a high ceilings and much glass for the lake views to the east and mountain views to the west. The kitchen contains a new Whirlpool dishwasher, new ceramic cook top (electric), stainless steel double-door refrigerator and all granite counter tops. The dining area is part of the open plan. 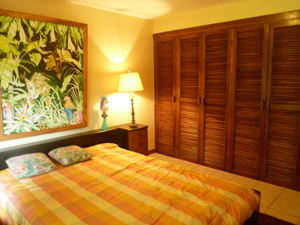 Part of the master bedroom suite. 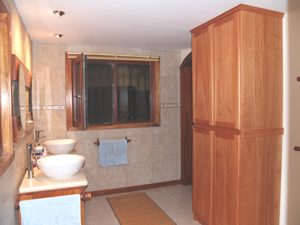 There are two other bedrooms in the bedroom/bathroom building. The home's entrance from the lake road. 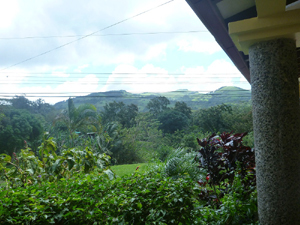 A view to the mountains behind Tronadora.